The report on Asia-Pacific gesture recognition and touchless sensing market deals with the in-depth analysis of the technologies, applications, products, and countries of the broad markets for the period from 2013 till 2018. The touchless sensing market has covered through two broad markets, namely, touchless sanitary equipment and touchless biometrics. All the applications, technologies and the major countries in APAC that hold potential for the future in the gesture recognition market have been identified and articulated in the report. The total Asia-Pacific touchless sensing and gesture recognition market is expected to reach $4.18 billion by 2018 at a double digit CAGR from 2013 till 2018. The market value in 2012 was approximately $442.65 million. The report focuses on the in-depth segmentation of all these markets by the different technologies, products, and applications. For instance, the touchless biometric market has been segmented by the different types like face, iris, voice, and touchless fingerprint biometrics. Similarly, the touchless sanitary equipment is segmented by the major products like faucets, soap dispensers, trash cans, hand dryers, paper towel dispenser, and flushes. The gesture recognition market has been segmented by technologies like 2D camera based, 3D camera based, ultrasonic, infrared arrays, and capacitive technology. These major technologies and products have been mapped against each other and also against the major countries. The market dynamics, i.e. drivers, restraints, and opportunities of each of the markets have been identified and explained in the report. The market estimation and forecasts have been done using market dynamics. The report has identified the major companies active in the current market and also those who have potential to emerge as prominent players. In addition to the company profiles, the report does provide a Competitive landscape (CL) of the key players for each of the markets. The CL covers market share analysis, mergers and acquisitions, collaborations, partnerships, new product developments, and the key growth strategies of each player. The touchless sensing and gesture recognition is also mapped against major individual countries. The market by geography is segmented by India, China, Japan, South Korea, Taiwan, Oceania and others, which gives a detailed insight of regional profit pockets and potential emerging markets. Apart from market segmentation, the report includes critical market data showing the price trend analysis, emerging trends and value chain analysis. The Asia-Pacific touchless sensing and gesture recognition market is estimated to grow at a healthy CAGR from 2013 till 2018 and to cross $4 billion by the end of these five years. Detailed segmentation of global touchless sensing and gesture recognition market by technology and products with a focus on markets of high growth and emerging technologies. The major drivers for the gesture recognition market are the user experience offered and the increasing focus of OEMs in the APAC market. India is the fastest growing region for touchless Biometric Market, while China leads in the touchless sanitary equipment market. Currently, consumer electronics application contributes more than 99% of the Asia-Pacific gesture recognition market. The factors such as evolving technology and increasing adoption by OEMs are rapidly changing the market ecosystem. Of all the major technologies, 2D camera-based technology is expected to have higher adoption rates for mass markets like smartphones. The 3D time-of-flight cameras are expected to see considerable shipments by late 2014 and early 2015. Gesture recognition in healthcare is mainly used for rehabilitation applications and will soon witness high demand for operating room applications. The automotive application for gesture recognition is expected to be commercialized in 2015. Porters analysis in detail, value chain analysis along with technology & market roadmaps, and evolution of each of the markets is given. The increasing security concerns in the major countries of the region have pushed for the need of accurate and reliable biometric systems. The e-passport program has picked up pace in many countries and the Aadhaar number initiative by the Indian government have created huge demand for the touchless biometrics. The touchless sanitary market that includes products like touchless faucets, touchless soap dispensers, touchless hand dryers and so on, will witness growth in their shipments as the governments increase their focus on hygiene in the region. The demand for touchless biometrics is on the rise owing to the accuracy on the part of the system. The contact-less biometric solutions are more hygienic as compared to the touch-based biometric systems. The touch-less sensing market is expected to reach $1.89 billion by the end of 2018 at a CAGR of 29.30%. The key players in the touch-less sanitary equipment market are iTouchless (U.S.), simplehuman LLC (U.S.). The key players in touchless biometric solutions include NEC Corporation (Japan), Fujitsu Limited (Japan), TST Biometrics (Germany), Touchless Biometric Systems (Germany), and IrisGuard (Switzerland). Majority of the global players have strong presence in the Asia-Pacific market. The huge demand for Smartphones and Tablets is a definite driver for the gesture recognition market in the APAC region. This is evident with the number of product launched, from the OEMs in the last two years. A number of OEMs, who have their footprint globally and in local markets, have launched products ranging from smartphones to smart TVs. 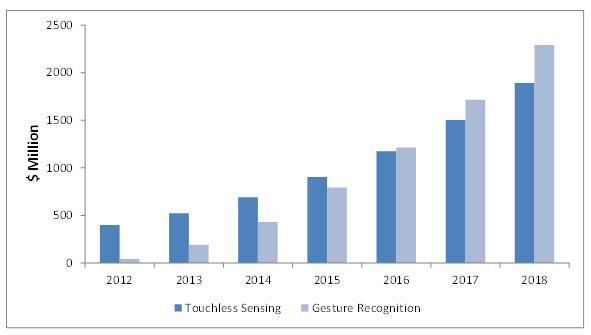 The figure below shows the trend of the Asia-Pacific gesture recognition and touchless sensing market from 2012 till 2018. The Asia-Pacific gesture recognition market is expected to reach $2.29 billion in 2018 from $43.32 million in 2012 at a CAGR of 83.18% from 2013 to 2018. Gesture recognition is still in the emerging phase but has proved to be the next generation technology that has the potential to revolutionize the way humans interact with machines. The technology is currently being integrated majorly into consumer electronics. This would help to push the technology towards maturity and in turn the decrease in price. Slowly, automotive application and healthcare would emerge as potential applications for the gesture recognition market in the near future. 9.25 XYZ Interactive Technologies, Inc.